AMD officially unveiled Trinity, the second generation of its A-series APU that is looking to rival Intel's Ivy Bridge for high-performance chips with low power consumption at an even lower cost. The Trinity line will launch in five models - three aimed at mainstream notebooks and two targeting the coveted "ultrathin" market, with designs for desktops and all-in-one PCs to follow later on. The two ultrathin notebook chips, the quad-core A10-4655M and dual-core A6-4455M, use a sparing 25W and 17W respectively. Additionally, AMD claims battery life lasts up to 12 hours in a "resting" state. That's an impressive figure - especially coming from a chip manufactured on the larger 32nm process compared to the 22nm chips Intel adopted for its Ivy Bridge processors. AMD is squeezing power efficiency out of a 32nm chip thanks to its new Piledriver architecture. While built on the less than impressive Bulldozer architecture as a base, Piledriver makes notable improvements in dynamic power management between the onboard CPU and GPU for a 29 percent performance increase over Bulldozer. This translates to faster startup times - 2 seconds to resume from sleep and 10 seconds for the initial boot to desktop - but also clock speed enhancements. The quad-core 25W chip has a default CPU speed of 2GHz that can jump up to 2.8GHz in a pinch, while the dual-core 17W chip can bump from 2.1GHz to 2.6GHz. Speaking of the Trinity's onboard GPU, AMD will equip Trinity processors with its Radeon HD 7000 line to give it a significant graphical boost. AMD claims a performance edge against comparable Ivy Bridge processors of up to 150 percent in mainstream games like Starcraft 2 and Dirt 3, though that statistic should be taken with a grain of salt since it hasn't been substantiated by any third-party benchmarks. Even so, given AMD and Intel's respective histories, it's fair to expect Trinity processors to have an edge. The final factor for AMD's Trinity processor is price, which is where the chip shines brightest. 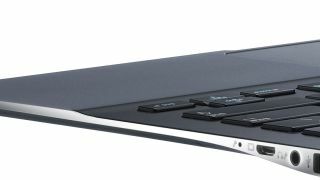 HP already set the trend for more super-thin notebooks when they announced a series of new Ultrabooks. And, the Trinity processor may face an uphill battle, with 80 percent of PCs using Intel processors. What's more, Intel smartly coined the term "Ultrabooks" for slim notebooks using its low-power processors, providing an easily marketable term for retailers to display. AMD doesn't have that yet, with HP adopting the non-standard term Sleekbook for its new Trinity notebook and AMD opting to simply call them "ultrathin notebooks." There's also stiff competition from Apple with rumors of a lower-cost Macbook Air and thinner Macbook Pro slated for later this year. Where AMD can carve a position in the ultrathin market will be through its graphics capabilities, since slim notebooks aren't typically known for their gaming capabilities. And if the price is right, AMD shouldn't be counted out yet.